Sweet Chai O’Mine is a solid 8,5% milk stout brewed with a mixture of traditional chai ingredients; ginger, cardamom, cinnamon & star anise. Rich flavours for an exceptional beer – a Scandic take on the Far East. We like to call it a Chai Stout. 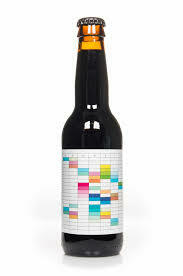 Kasper Ledet on the label design: The rich flavours is illustrated by colours organised in a spreadsheet. It is abstract painting in Excel.